Located in the original station buildings, the Brasserie provides a variety of British cuisine which can also be enjoyed in the alfresco area. 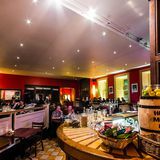 Green Park Brasserie also hosts regular jazz evenings. 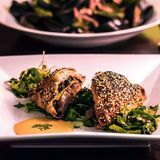 "Dine in the stunning original station house that is the Green Park Brasserie. Perfect for casual dining we have a range of menus, early dining options and a la carte. 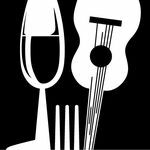 With live Jazz and Acoustic Music every evening from Wednesday through Saturday, we want our diners to relax and make the most of their evening with us. 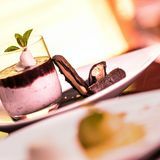 Mid morning coffee and pastries, working lunches, after work drinks, cocktails and dining, we invite you to savour our locally sourced dishes, draught beers and extensive wine list. Ideal for groups with specially designed menus and great value options. Our well-establshed Christmas Party Nights run from the end of November." 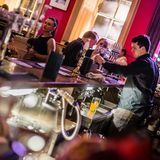 Wide range of draught beers and over 12 wines served by the glass. Two outside areas, one outdoor smoking area and one non-smoking fully enclosed outdoor area. What did you think of Green Park Brasserie? Sitting out in the back garden is a treat here! Everyone gets together and meets up down here and we have a right giggle. Its full of nice people who just want to have a few drinks and a natter.